The Ultrafast Nonlinear Optics and Biophotonics Laboratory at Tufts University School of Engineering has leased 9,700 s/f of class A custom lab space at 200 Boston Ave. 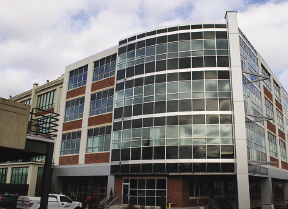 The laboratory (known less formally as Omenetto Lab, after its principal investigator) now occupies the entire fourth floor of a newly built addition at the Cummings Properties-managed building. Omenetto Lab was previously located in 6,000 s/f on the ground floor of the Boston Ave. building. A need for a larger and more specialized facility prompted its move upstairs, where Cummings Properties built out a mix of office and laboratory space featuring eight separate process rooms. Within the new lab, Dr. Fiorenzo Omenetto and his team will continue researching nanostructured materials and high-tech applications for silk. Their innovations, which include edible optical sensors, surgical mesh, and electronics that dissolve over time, have applications in food safety, healthcare, and consumer electronics. "We are pleased to have been able to meet the needs of this growing research facility," said leasing officer Tony Spencer. Tufts University currently occupies about half of the 300,000 s/f of commercial space at Cummings Properties' Boston Ave. campus. Tufts University School of Engineering offers both graduate and undergraduate programs in the innovative and ethical application of science and technology, with a focus on engineering for health, sustainability, and the human/technology interface. Cummings Properties is one of the largest commercial real estate leasing firms in the greater Boston area, with a portfolio of nearly 10 million s/f across 10 suburban communities. Since 1970, Cummings has identified and met its clients' needs using a full-service approach.